SYDNEY (WAM) — A major Australian copper rod manufacturer and a UAE investor signed here on March 16 a Memorandum of Understanding (MOU) to set up a plant in Musaffah, Abu Dhabi, for the production of continuous cast and rolled copper rod at a total cost of over Dh 100 million. 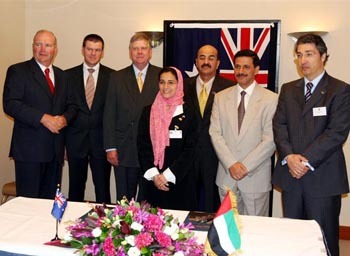 The MoU between Australian copper rod manufacturer Kembla Wire & Rod and UAE national investor Emirates Link Group was inked on the sideline of the official visit to Australia of Sheikha Lubna Al Qasimi, Minister of Economy and Planning, who arrived here on March 14 at the head of a high-level delegation. The plant will be the first of its kind in the UAE and the third in the GCC countries, and with an annual capacity of 165,000 tonnes will be the largest in the Middle East. The parties to the MOU expect commencement of production and market distribution of copper rod from the new plant by early 2006. It is forecast that production of this critical feed material for the cable industry in-country will enhance the GDP of the Abu Dhabi emirates by Dh 175 million per annum, according to Iyad Al Ansari, general manager of the Emirates Link Group. It is expected that production from the plant will be able to meet the majority of the regional demand of UAE, Oman, Kuwait, Jordan, Lebanon, Syria and Qatar in the near future. "Cable manufacturers in these countries who are currently importing their copper rod requirements from India, Russia and Africa will find it more convenient and more cost effective to secure their needs from the new Abu Dhabi plant," said Al Ansari.